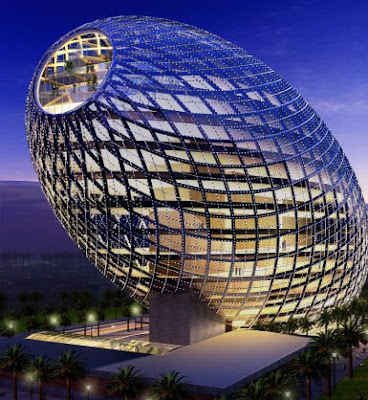 Cybertecture office building, this futuristic design is from James Law Cybertecture International, commissioned by Vijay Associate (Wadhwa Developers) for Mumbai, India. 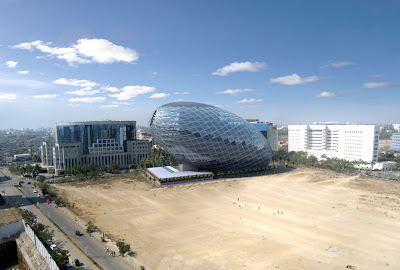 The 32,000 sq m eggshaped building will accommodate 13 floors of offices and will combine "iconic architecture, environmental design, intelligent systems, and new engineering to create an awe-inspiring landmark in the city." The design has intelligence systems, which integrates technology, multimedia, intelligence system and user interactivity that includes monitoring occupant's vital health statistics. 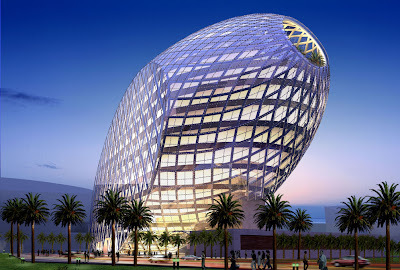 And to generate electricity, solar photovoltaic panels and rooftop wind turbines will be installed on top of the building. 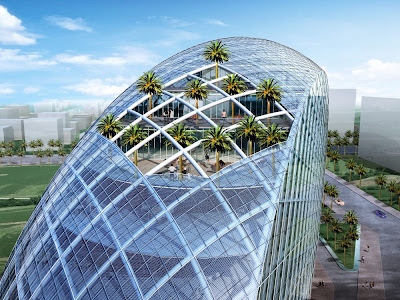 Apart from these, the sky garden on the top of building will moderate temperate and assist in cooling the building. A water filtration system will be installed in the building which will harvest water for irrigation and landscaping by grey water recycling that will help in water conservation. The building is supposed to complete by the end of 2010. Awesome Rock Balancing - Part 2. XO Move - Foldable Scooter. The Big Picture - World's Largest Photomosaic. TheBox - Interesting Piece Of Furniture. Bubblicious - A Fruit Basket. Why You Should Avoid Asking For Help Online. A Table: Bird House Sculpture. 6 Coolest External HDD Cases. Museum Liaunig By Austrian Architects Querkraft. Conceptual Dishware: Small Apple Dish. Yokohama Housing By Torafu Architects. Engine Offices Interiors By Jump Studios. 20 Hilarious License Plates – Part 3.